Wedding invitations with ribbon are special for a few different reasons. The ribbon adds a unique touch of style and character to your wedding invitation, creating an eye-catching look your guests will never forget. The ribbon is also a great way to pull your wedding colors into the invites. 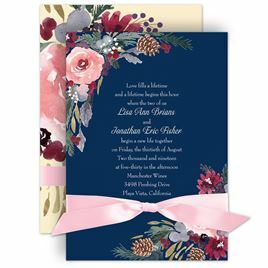 Personalize your ribbon wedding invitations to coordinate beautifully with your wedding colors by choosing the perfect color of ribbon and inks. 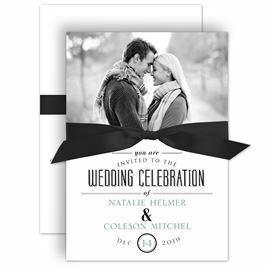 Wedding invitations with ribbon are an affordable choice for embellished wedding invitations but if you're looking for other ways to add a special DIY touch to your invites, check out wedding invitation pockets and wraps.